416 Fire: 54,129 acres, 45 percent containment, Durango, Colo., area. Burro Fire: 4,593 acres, 40 percent containment, south of Rico, Colo.
Chedsey Fire: 45 acres, 75 percent containment, southwest of Walden, Colo.
High Chateau Fire: 1,423 acres, 91 percent containment, northwest of Cripple Creek, Colo.
Lake Christine Fire: 5,263 acres, Basalt, Colo., area. No containment percentage available. 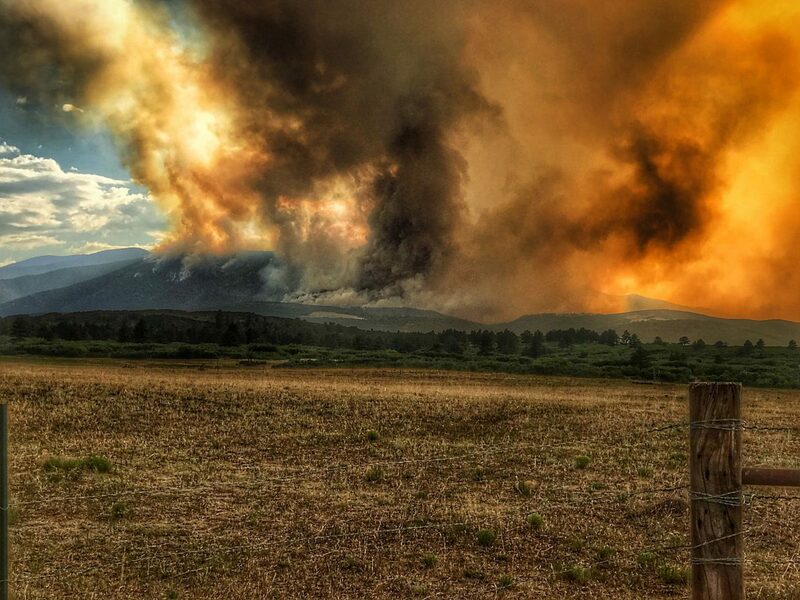 Spring Fire: 105,704 acres, 35 percent containment, Fort Garland, Colo. area. Sugarloaf Fire: 1,245 acres, Fraser, Colo. No containment percentage available. Weston Pass Fire: 12,902 acres, 17 percent containment, Fairplay, Colo.
Badger Creek Fire: 21,196 acres, 80 percent containment, Mountain Home, Wyo., area. Rain moved into the valley near LaVeta, Colo., Thursday night and aided the firefighters to reach 35 percent containment on a fire that has raged for days and consumed, according to the National Wildfire Coordinating Group, nearly 106,000 acres. 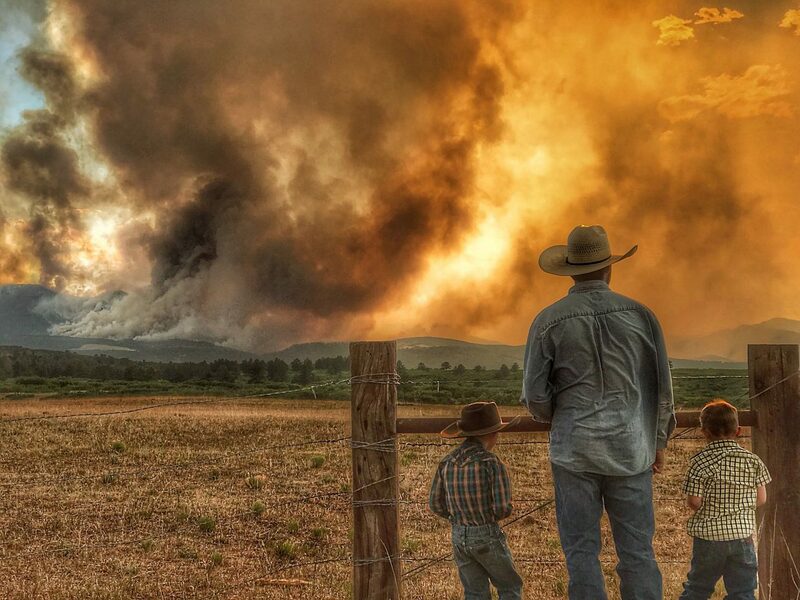 For area farmers and ranchers, though, the rain is merely a drop in the bucket of what's needed and the Spring Creek Fire, though being reported as caused by human actions, is a symptom of a serious problem. Betty Kreutzer, a rancher in the LaVeta area, said they took half of their cattle herd to summer pasture and kept the other half close so they could feed hay to them, a daily chore that didn't cease when springtime came. The area around LaVeta, she said, typically has enough moisture to grow spring grass that lasts until fall but this year the grass is sparse and springs and rivers used to water stock have dried up, making it only possible to utilize some pastures if water is hauled in. "You try to put them where they can get water and have pretty good grass with the hay," she said. "You hope you can hold on to them until the time the calves are ready to sell, anywhere from October to December." The Kreutzers haven't had to early wean calves yet but she said some neighbors have been forced to make the management decision to do so in order to retain mature cows. "It's possible that will come," she said. "This is only the first part of July." The Kreutzers have marketed through sale barns in the past but sold directly off the ranch last year, cutting down on trucking expenses. The family markets about 200 calves annually with 30-40 late born calves sold in the spring. "People don't realize when you sell cattle, you only get one paycheck a year so I try to manage that," she said. The fourth generation ranch was built by Betty's father, Harry Willis, who ran it until he was no longer able and Betty and her husband Bud, and her sister and her husband moved back to run it in his stead. Now, the Kreutzer's son and four of their grandsons all play a part in the ranch's operations, mostly also with off the ranch employment. To diversify and manage expenses, the family maintains a hay farm near LaJara, Colo., and this allows them to raise their own hay rather than purchasing it, an expense that would be exceptionally high in a drought year such as this one. Managing around drought, she said, has been difficult but the Spring Fire made the stakes much higher. "We, as ranchers, say we don't gamble," she said. "But we're probably the biggest gamblers there are." When the Spring Fire began, the Kreutzer's grandson, Chance Price, wasted no time making fire lines on the ridge overlooking the property. "We were almost in the middle of it for two days," she said. "It looked like it was going to get here and it got pretty close. It didn't get to (the fire wall). Then it branched out and one part of the fire went north and one part of the fire went south. We were sitting here in the middle wondering, if the wind blows, which one will get us?" The houses remained untouched, which Kreutzer calls a blessing. Even though pasture was burned, she said it will grow back and she's grateful to the firefighters and thankful they've been safe. Price and his wife, Tomi, live on the ranch in the house his grandmother grew up in. The property was sold at one point but came back on the market about seven years ago, when the family bought it back. Both work off the ranch but are raising their two sons, Truitt, 6, and Sawyer, 4, to understand and appreciate their ranching heritage. When the fire began, Tomi, who is originally from Goodland, Kan., was visiting her family and was getting updates from Chance. The fire was burning west of the ranch and the first text between the two was a photo of a small plume of smoke. Thursday morning he called to tell her the fire was rapidly growing and moving to the east. "By Thursday evening he was in some sort of a panic," she said. "That's really out of character for him, he's very calm and doesn't usually get too worked up. That's when I knew things were bad." The next text message had a photo Chance had taken from the backhoe he was using to build the firewall and the flames were about two miles away at that point. Tomi and the couple's two boys returned to their home Sunday knowing there wasn't much else they could do other than wait. On Sunday evening, Tomi shot a few photos of Chance and the boys watching the fire that have since made the rounds on social media. "My oldest was pretty concerned," she said. "He asked several times if the fire was going to reach our home and we assured him that we were sitting in a good place surrounded by grass and a hayfield." Even with the fireline and assurance from Chance and Tomi, she said she can only imagine what the situation looks like through the eyes of her boys. "They're seeing this beautiful valley we've always called God's Country going up in flames," she said. 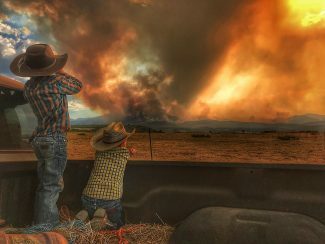 Even at 6 years old, Truitt dreams of returning to the ranch and Tomi said they were praying that his dreams weren't literally going up in smoke. Even as the fire is brought closer to containment and a small amount of rain falls, the ranchers still face drought conditions and a lack of pasture and the expense of hay. Ranchers, a group Kreutzer said used to be numerous in the area, are becoming fewer as land prices are driven up and the area becomes more of a tourist stop than an agricultural stronghold. As part of a vicious cycle, she said she expects the fires to hurt the real estate business and tourist business, in turn causing small towns to lose income. "It we get a little rain, the grass should still grow," Kreutzer said. "Now we just wait and see what Mother Nature provides. It's kind of hard on the pocketbook but we've learned to live with that." Rio Cucharas Vet Clinic, 22450 US 16, Walsenburg, CO. No equipment is available at this drop off so only small bales are accepted. rachelspencermedia@gmail.com or on Facebook at Rachel Spencer Media.